used for concrete washouts, mortar, stucco & paint. A cost effective unit designed for easy setup and disposal. It holds .69 cubic yards or 7-10 concrete washouts & is wheelbarrow and concrete ready mix compatible. Washout: concrete, stucco, mortar, paint, drywall, mud, and more. 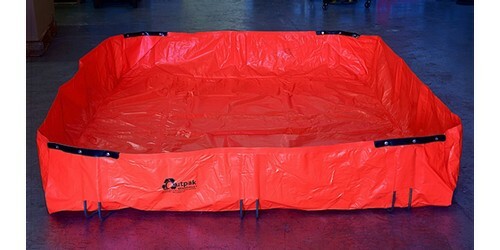 The 6 x 8' Outpak washout is designed to provide a simple construction washout solution for larger jobs. Constructed out of PVC it's also pump truck friendly and can hold 2 cubic yards or 25-30 concrete washouts. This easy to use system stores flat but when needed quickly pops out into a ready to use box - quickly rinse out your concrete, stucco, mortar, paint, and drywall mud into an EPA compliant container. 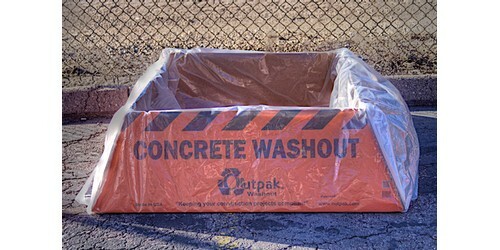 New from Outpak is the All Weather 6' x 6' portable concrete washout container. Stores flat but quickly pops out into an easy-to-rinse, ready-to-use EPA compliant box. 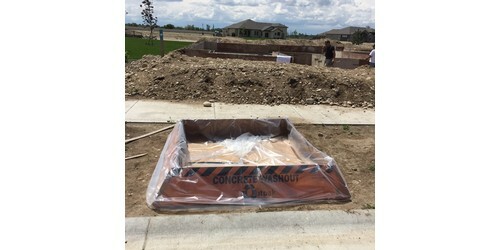 At 8 x 10' this unit is capable of holding 3.45 cubic yards or 50-60 concrete washouts. Made of PVC material and able to fit under concrete ready mix and pump trucks it's your solution for larger commercial jobs. Durable, reusable, effective sediment control wattle. 20 times less dirt loss than conventional methods. 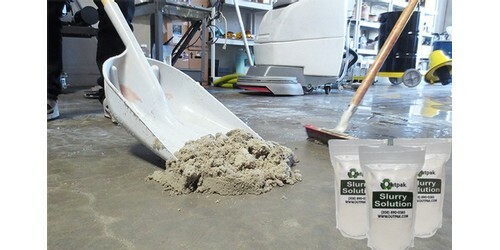 Slurry Solution Solidifier absorbs excess slurry liquid quickly into a dry material that leaves no residue. Includes 20 bags. This easy-to-setup washout is perfect for washing out paint, stucco, and drywall mud.